Police are investigating a shooting near downtown San Jose that has left two people with life threatening injuries, officials said. Ian Cull reports. 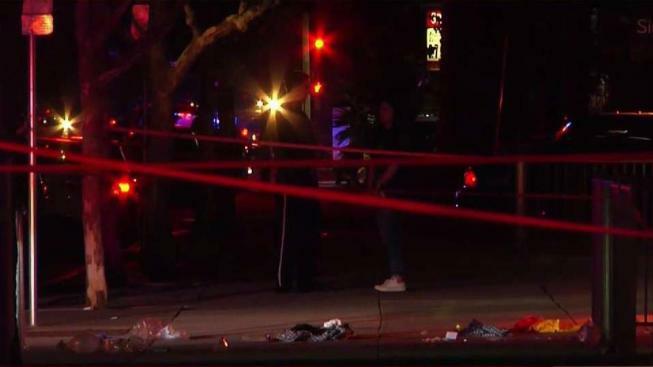 One man is dead and another is hospitalized in stable condition following a shooting Thursday night near downtown San Jose, police said. The shooting was reported at 9:37 p.m. Thursday near 8th and Taylor streets. The shooting appears to have happened outside the Taylor Street Night Market, across the street from Gordon Biersch Brewery. Police said the suspect(s) fled the scene on foot and have not been identified. 3/3 We will update when possible. A heartfelt thank you to @SJFirefighters@SJFD@SanJosePD for their help with this tragedy. 2/3 One has died, the other is stable. 5 FFs were out together in SJ. The other FFs rendered aid to their fallen brothers on scene. With a heavy heart we can confirm that 2 of our #firefighters were shot in SJ in an unprovoked incident.